When is Cortana coming to Windows Phone in the UK? Windows Phone 8.1 is here complete with a raft of improvements and new features, but one of the most exciting additions, Cortana, has so far been absent from the UK version. So why is that? When's it coming? And what will it offer when it arrives? Read on for answers to all those questions. Two weeks later, the promise came true: Cortana is now here for those that want it. But don't pull out the party poppers yet (and not least because that would be terribly lame) as it's not the final version. What's available is the developer preview, so this isn't the fully localised version. It's meant for developers, as the name suggests, but that doesn't mean everyone else can't grab it too as technically anyone can register as a developer, but bear in mind that doing so may void your warranty. As for when we'll see the final, fit for public consumption version that's less clear, with Microsoft claiming that we'll all have access to the 'proper' Cortana in the 'coming months'. However O2 recently announced that it will be arriving in quarter 4 of the year according to ExpertReviews, so in other words sometime between October and December. Why isn't is here yet? Localising Cortana is a big job, despite the fact that the language is more or less the same as the American version. Microsoft needs to make sure it can understand British accents and add localised information. Strictly speaking there shouldn't be any need for Microsoft to totally re-voice it but apparently it has anyway, giving the British version a British accent, which must have been a huge job in itself. That presumably means a voice fit for a BBC newscaster but you never know, we might get a Cortana with a thick Scottish accent. 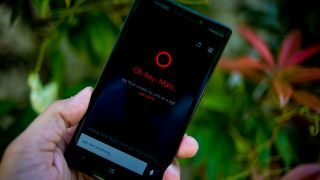 Cortana finally gives Microsoft an answer to Siri and Google Now providing a hands free, voice operated personal assistant which can both find information from the internet and carry out tasks, such as setting reminders. Cortana can even learn from you, automatically giving you relevant travel alerts for example, or silencing your phone at the times that you would normally do so. So Cortana in the UK will give UK Windows Phone users access to all of these features and more, and because Microsoft has fully localised it right down to the accent it should understand you and be easy to understand in turn, as well as providing relevant, local information, not to mention ignoring the NFL when you ask for football scores. Want to know more about Cortana? Here's all the info.